There are a handful of pipe joining methods that have been adopted by the construction industry, today. These methods are accompanied by an overwhelming amount of resources to guide you through a practical and sustainable piping design. When it comes to Victaulic questions, we want to make it as easy as possible for you to find the answers you need. 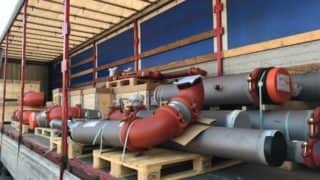 That is why Victaulic employs a global team of engineers from various backgrounds that support our customers and provide experienced guidance. On any given day, you will see them out in the field helping to demonstrate installations, taking calls from around the world, and writing letters to address potential application concerns. And they aren’t just answering Victaulic questions. Victaulic engineers are known around the world for their breadth of application engineering knowledge. But for today’s blog post we asked our engineers to give us the top 10 Victaulic questions they hear. Which Victaulic pipe coupling should I use for vacuum applications? For vacuum applications, any Victaulic pipe coupling that features our Installation-Ready™ or FlushSeal™ gasket profiles should be used. Can Victaulic gaskets be used in drinking water applications? Yes, Victaulic offers gaskets designed specifically for drinking water applications that hold a variety of agency approvals around the world. For a complete list of ANSI/NSF 61 and 372 approved gaskets for drinking water applications refer to submittal publication 02.06. Can Victaulic products be buried? Yes, Victaulic products are designed to be buried, however, there are considerations that need to be made for each application such as soil conditions and available coatings. The selection is based on the requirement of the project. What is the maximum coating thickness that can be applied to Victaulic products? It is common to coat products to increase the corrosion resistance of the base metal. The maximum coating thickness that can be applied to Victaulic products is .010 ”/.25 mm. This information can be found in the I-100 Victaulic Field Installation Handbook on page 20. Are Victaulic gaskets compatible with glycol? Yes, Victaulic EPDM gaskets are compatible with glycol. This information can be found in the Seal Selection Guide (05.01). How do I confirm Victaulic’s gasket compatibility with a fluid? To confirm Victaulic’s gasket compatibility with a fluid, please reference the Seal Selection Guide (05.01), or contact the Victaulic Applications Engineering Department. What is the difference between a Victaulic rigid pipe coupling and a flexible pipe coupling? The answer to this question is a bit complicated, but simply put, the difference between a Victaulic rigid pipe coupling and a flexible pipe coupling is the movement capabilities of the joint. Flexible pipe couplings provide axial and deflection movement capabilities. Rigid couplings do not allow movement in the joint. Typical applications for flexible pipe couplings include thermal accommodation as well as seismic, vibration and noise attenuation. For more information on the differences between rigid and flexible pipe couplings and the history of how they were invented, check out this recent blog post. Where can I find Victaulic pressure ratings? You can find the pressure ratings of each Victaulic product in the individual product technical submittals. These submittals can be found here. How do I know if my pipe grooves meet Victaulic specifications? Victaulic offers numerous pipe groove profiles. To confirm your pipe grooves meet Victaulic specifications, reference one of the groove specification documents below. Victaulic Grooved Specifications can be found on www.victaulic.com. Can I use Victaulic products on any pipe material? Victaulic products are designed for use on several types of pipe including carbon steel, stainless steel, ductile iron, PVC, CPVC, HDPE, aluminum, and copper. To determine if a product may be used on any of those materials mentioned above, view the Victaulic Product Guide. Did we answer your question in this post? If not, contact the Victaulic Applications Engineering team who is standing by to field your questions. And be on the lookout for future blog posts where we try to capture more answers to some of your commonly asked Victaulic questions.